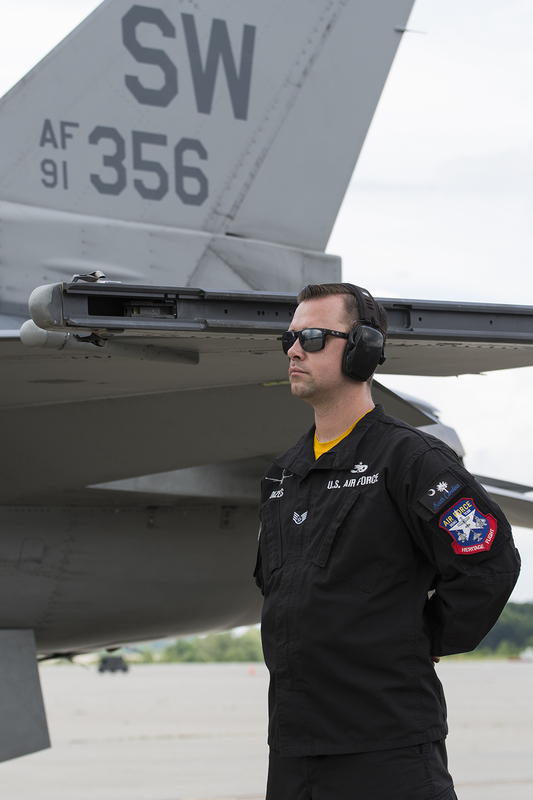 Thought Stewart International Airport was bathed in sunshine, the sky towards the west from the Air National Guard ramp did not look promising, as crew chiefs SSgt. Billy Harris and SSgt. 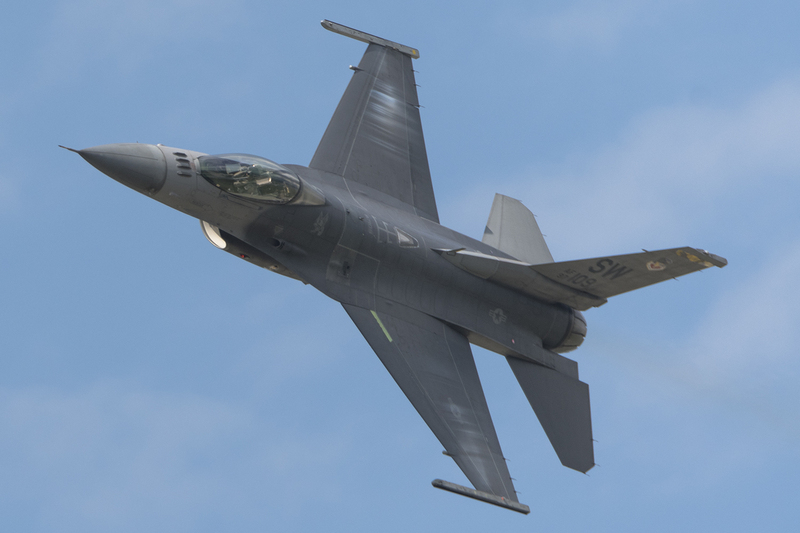 Dominic Dizes began to prepare the two F-16s, based at Shaw AFB in South Carolina, as primary and backup jets for the flight. 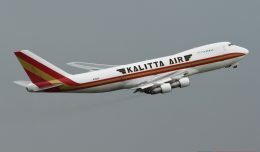 Numerous panels were opened and the aircraft’s systems were checked over and primed by the two skilled maintainers. 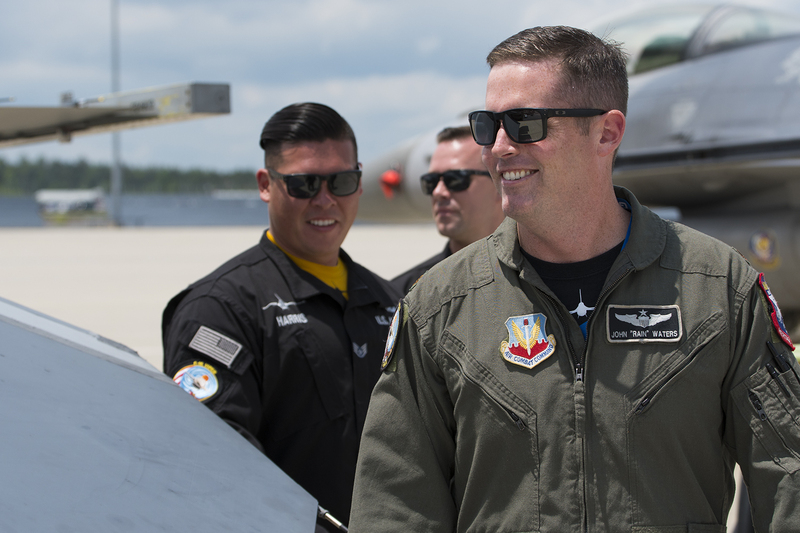 Across the ramp, the F-35 Heritage Flight team was preparing their two aircraft for an exhibition, and a Stewart-based C-17 from the 105 Airlift Wing was taxiing out to the runway for a demonstration of the most modern airlifter in the Air Force’s fleet. 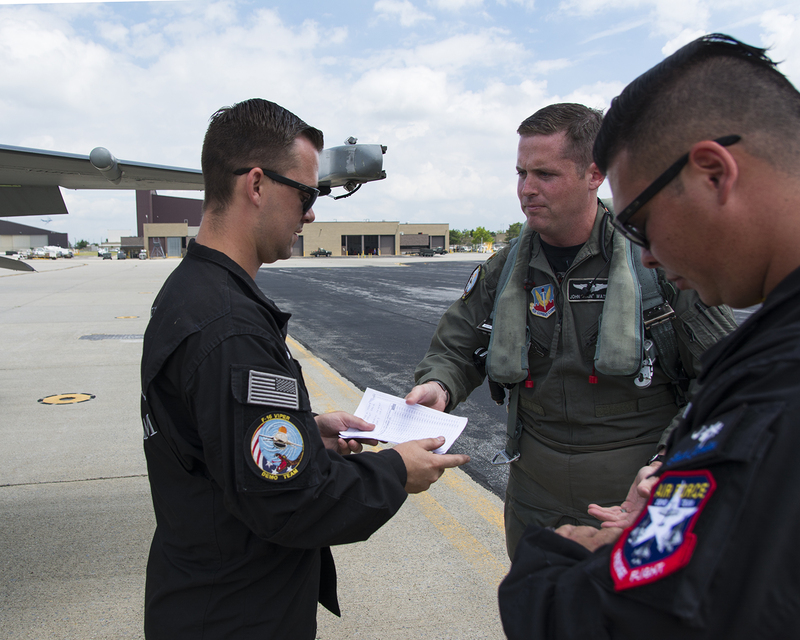 With plugs and covers removed and the HGU-55/P helmet staged on the canopy rail, Maj. John “Rain” Waters finished up a preflight briefing with his safety observer, as well as a brief weather discussion with Maj. Will “D-Rail” Andreotta of the F-35 team. 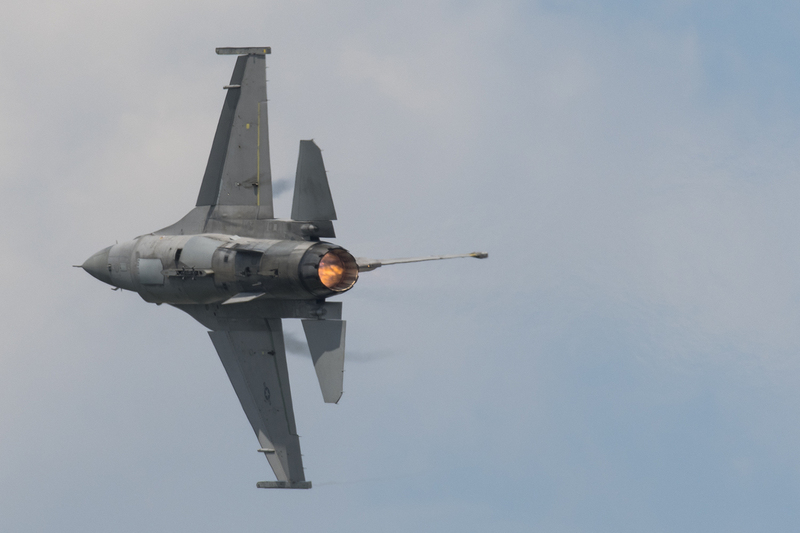 Due to the incoming storms, the schedule of the New York Airshow had been pushed up, with an emphasis on ensuring the military teams were able to fly while the weather was suitable for high performance low altitude flying. 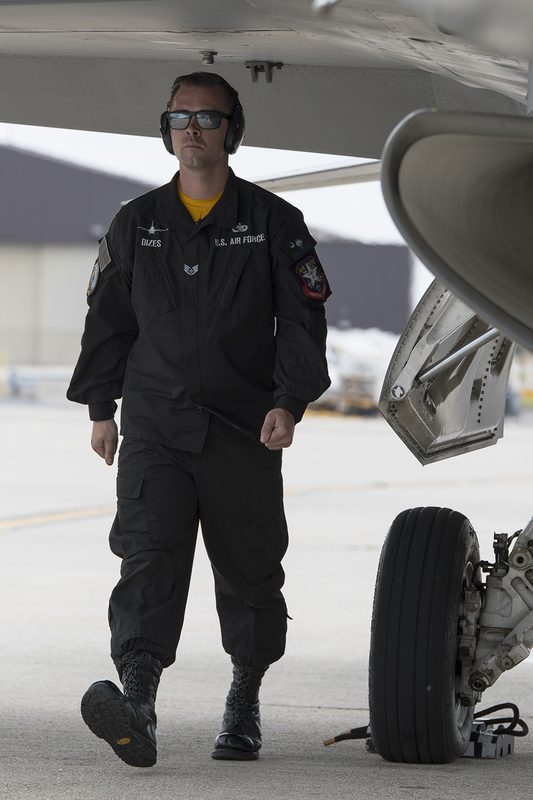 With briefs completed, “Rain” joined his crew for a preflight inspection of the F-16C wearing the number 91-0356. The amount of trust and rapport between the team members was immediately evident, with SSgt. Harris, SSgt. Dizes, and Maj. Waters smiling, talking, and joking with each other as they gave the Viper a once over. 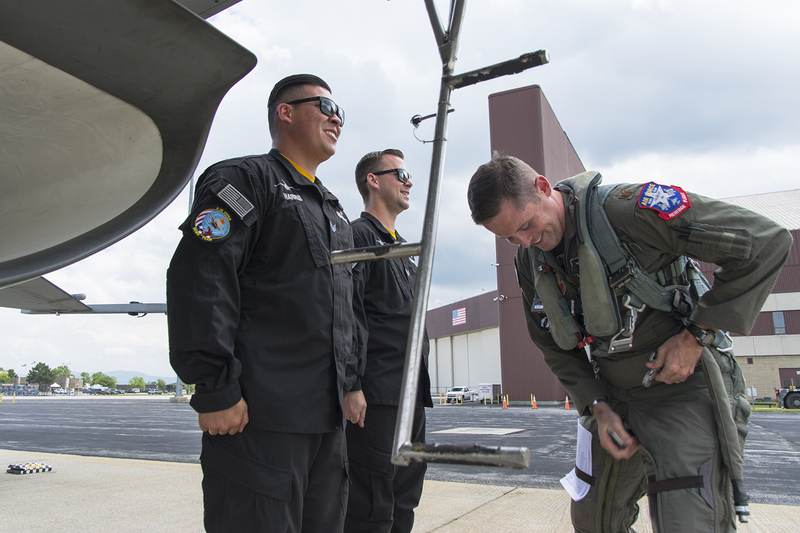 Unlike the US Navy’s TACDEMO teams that draw from a pool of personnel in training squadrons, Maj. 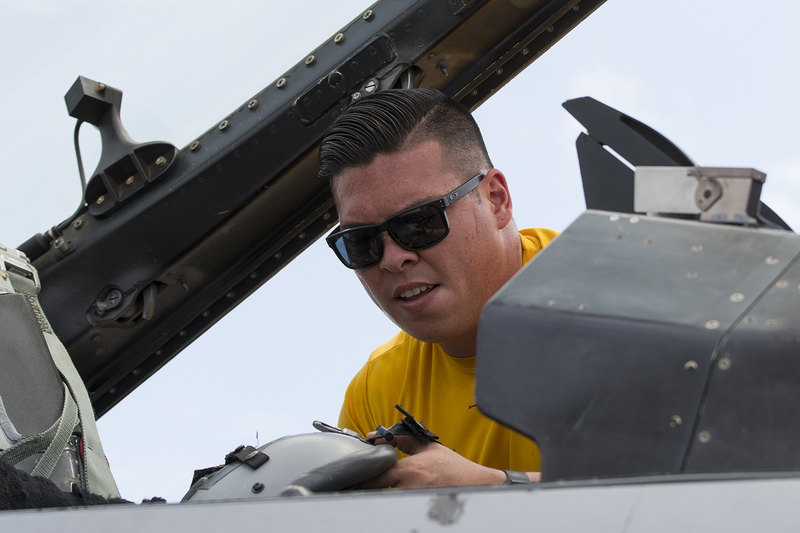 Waters is the commander and sole demonstration pilot for the Viper Demo Team, and has a dedicated crew of seven enlisted maintainers and public affairs personnel who travel with the team. 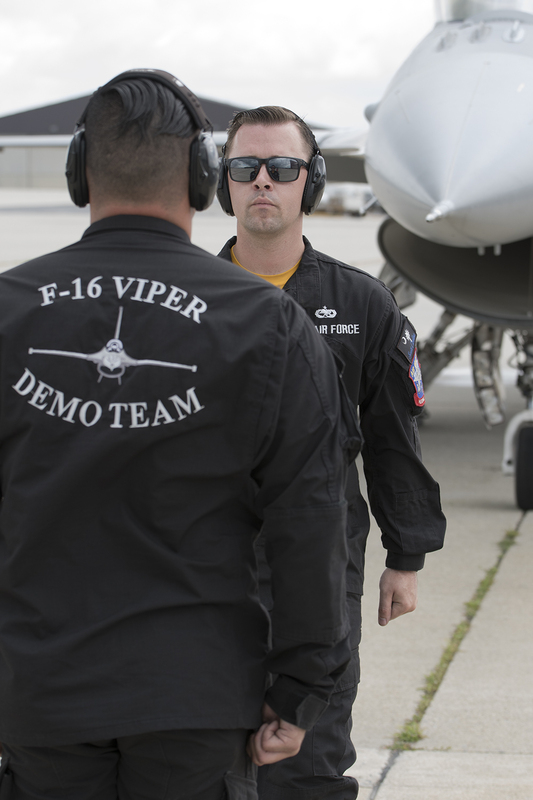 The Viper Demo Team’s goal is to both inspire the next generation of servicemembers and bring a demonstration of the capabilities of the Air Force’s premier lightweight multirole fighter to the citizens of the United States. 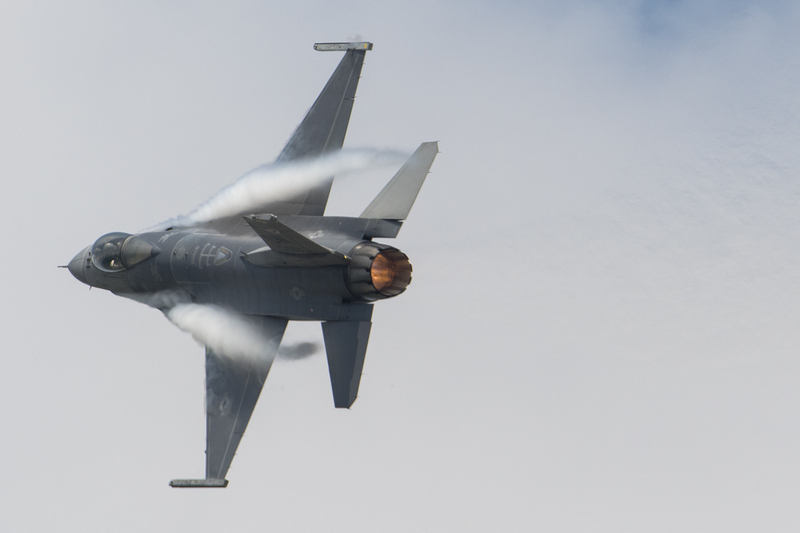 “Rain” and the rest of the Viper Demo Team are scheduled to perform at 21 airshows in 15 states and 3 countries in the 2017 season, showing off the agility of the F-16 as well as the professionalism, dedication, and pride of the United States Air Force at each and every stop. Harris, left, and SSgt. 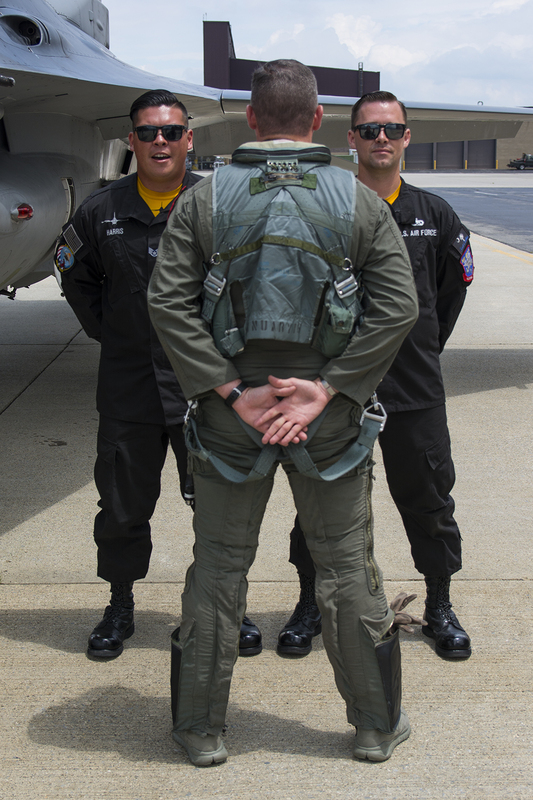 Dominic Dizes, right, as Maj. John “Rain” Waters suits up. 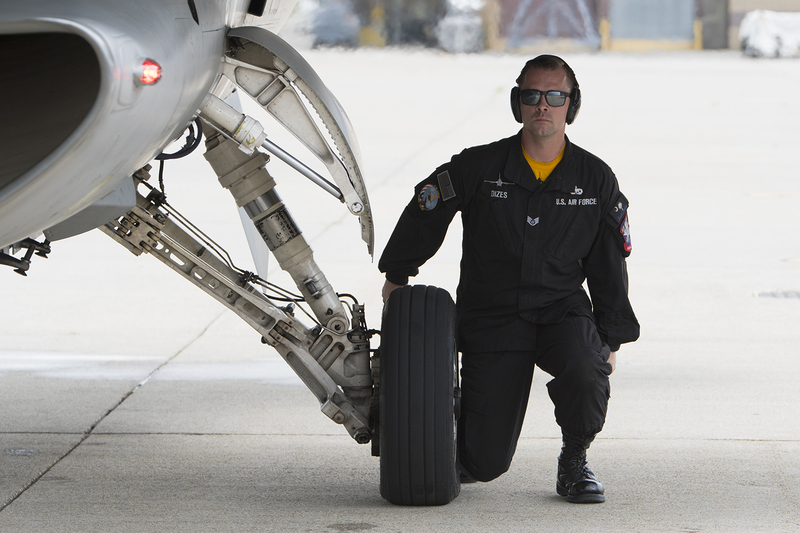 After a lap around the aircraft, Maj. Waters pulled on his g-suit while confirming that paperwork was in order with the crew chiefs. 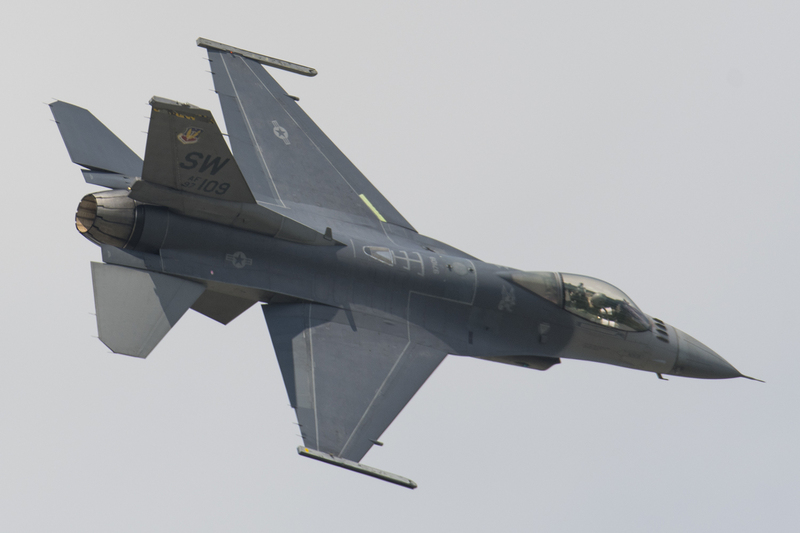 In his second year on the Viper Demo Team, SSgt. Billy Harris was the lead crew chief for this flight, and assisted “Rain” strapping in before removing the cockpit ladder. 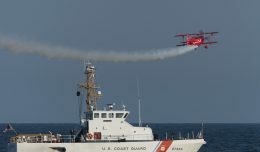 Despite the fact that the only observer on the ramp was an NYCAviation photographer with the crowd a mile from the ramp, the team performed each and every preflight task with the type of precision that you’d expect from the Thunderbirds or Blue Angels with crisp salutes and precise movements and signals around the aircraft being on full display. The sweet smell of burned JP-8 soon wafted around the ramp as Maj. 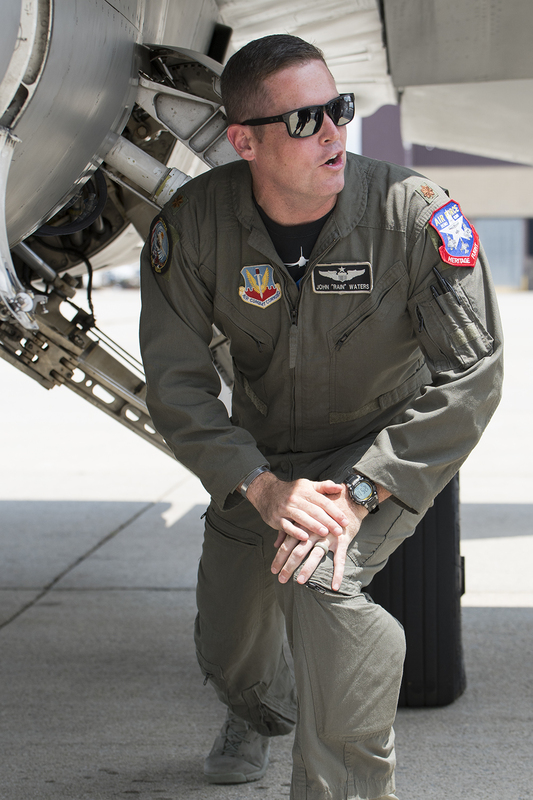 Waters started the engine on the command of SSgt. Harris. 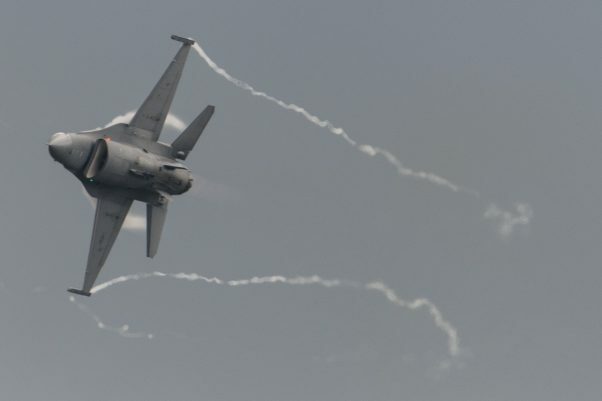 The high pitched whine of an idling turbine pierced the air as SSgt. 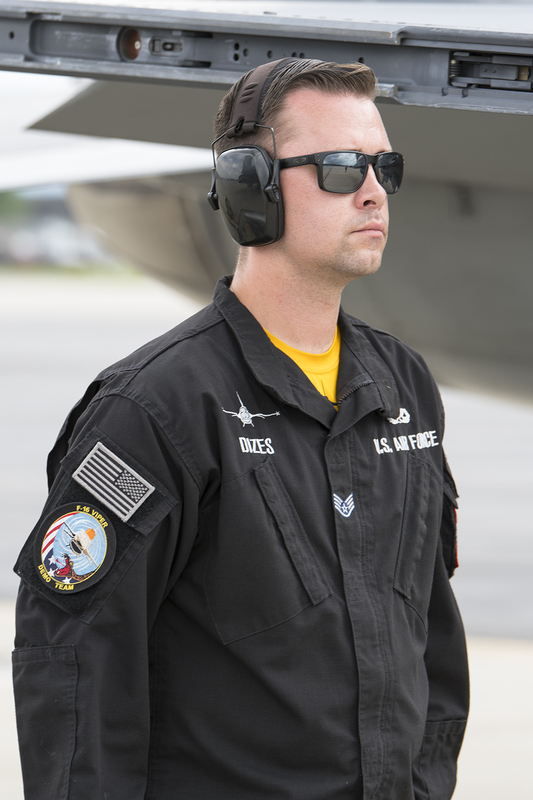 Dizes made his way around the aircraft and ensuring all systems were working as “Rain” cycled the control surfaces on the signal of SSgt. Harris. 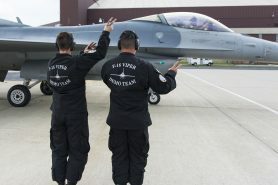 Hand signals between the cockpit and crew chiefs confirmed that the jet was in working order, and at the completion of the preflight checks, “Rain” taxied out for the demo, exchanging salutes and hand signals with the crew chiefs on the way out. Maj. Waters took off following his Air Force Heritage flight wingmen, Andrew McKenna, in a P-51, and Maj. Andreotta in the F-35. 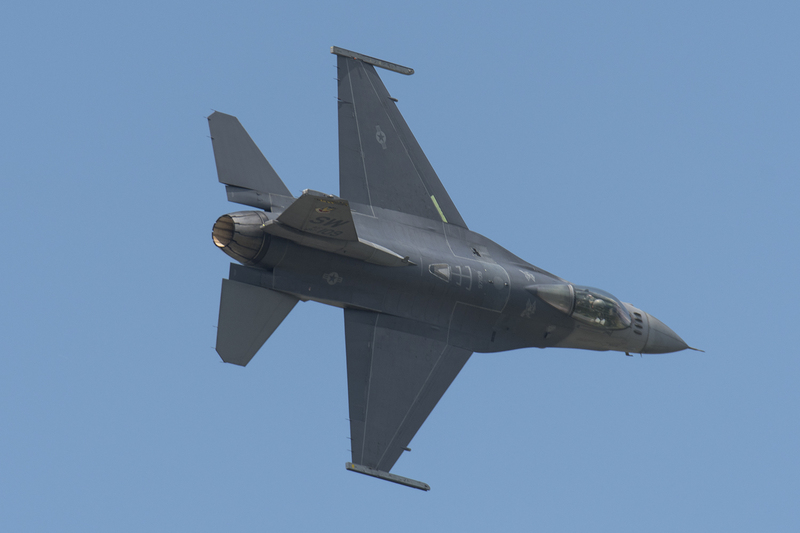 While the Mustang and Lightning held behind the crowd, “Rain” began wringing out the F-16, with a series of high speed and high-g maneuvers to show off the Viper’s agility. 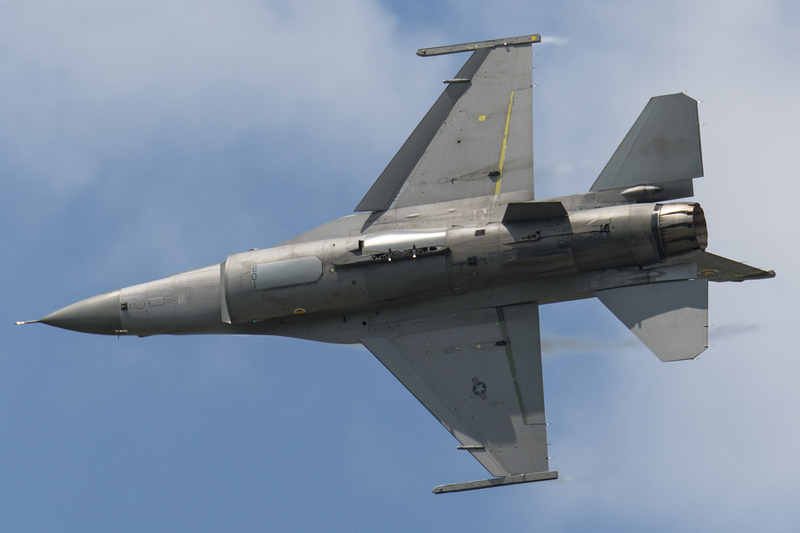 The humidity in the air and dark clouds were a perfect recipe to see large amounts of vapor trailing from the wingtips and LEX strakes on the Viper as Maj. Waters sliced through the airspace over Newburgh. 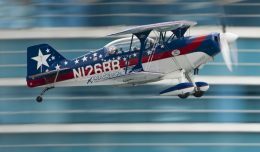 At the conclusion of one of the passes, it became obvious to the crew chiefs that a “Knock it off” has been called, and radio transmissions confirmed what our eyes and radar apps already told us as a heavy isolated rain shower had moved into the aerobatic box. 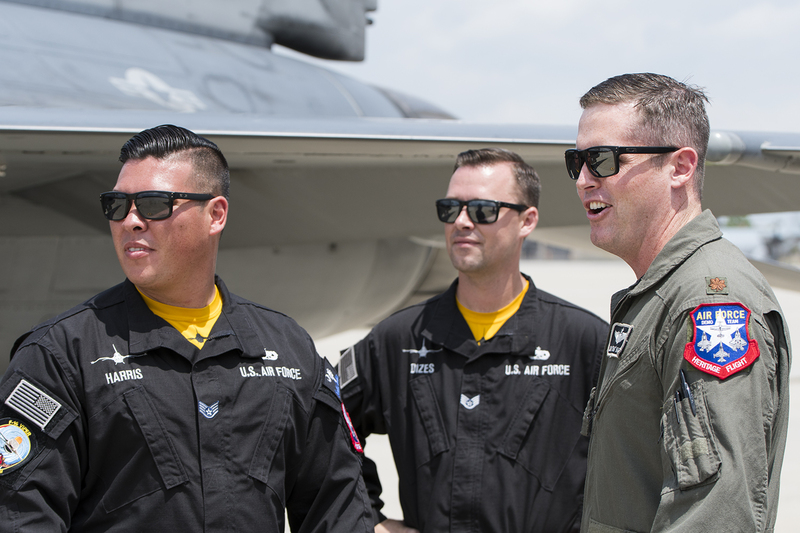 A few minutes without afterburner noise offered a great chance to speak with the crew chiefs. During the shower, Maj. 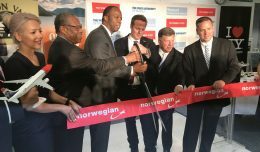 Waters continued to circle the area to evaluate visibility and ceilings, and as soon as the shower cleared the box, he completed the demonstration. 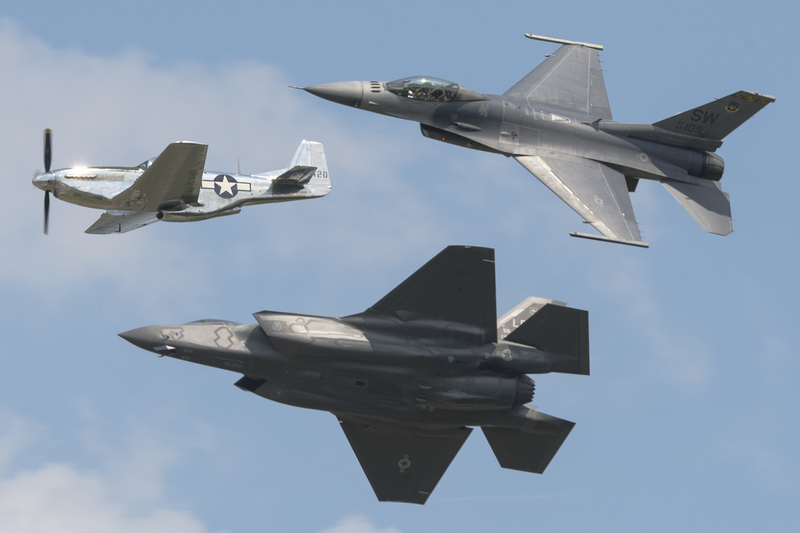 After the final pass of the demo, “Rain” rejoined with the P-51 and F-35 in a formation showing off the past, present and future of American airpower. 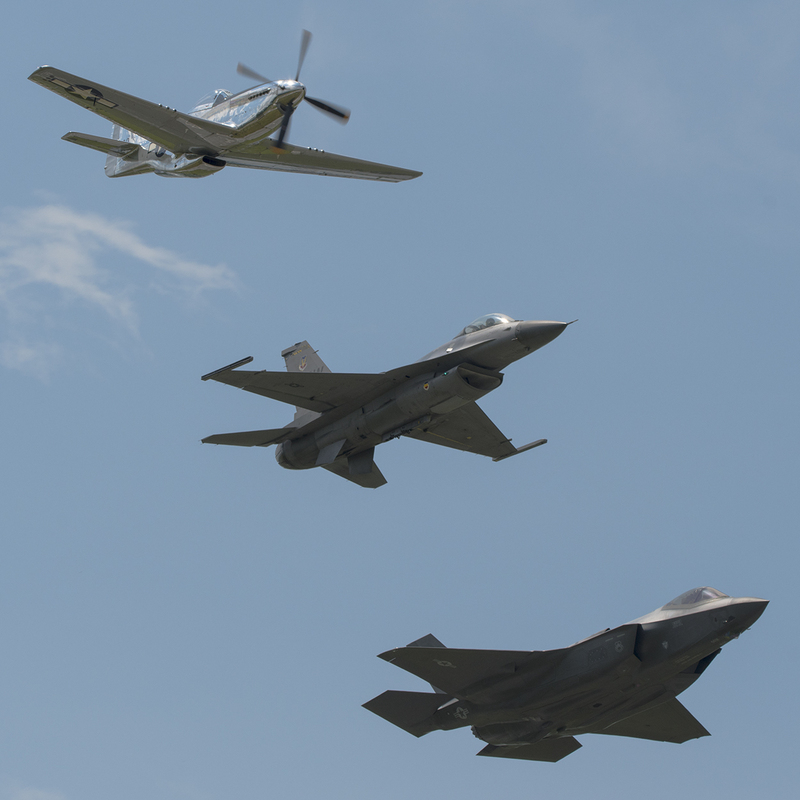 After a few passes in wedge and echelon formation, the aircraft approached from behind the crowd and separated in a dramatic break. 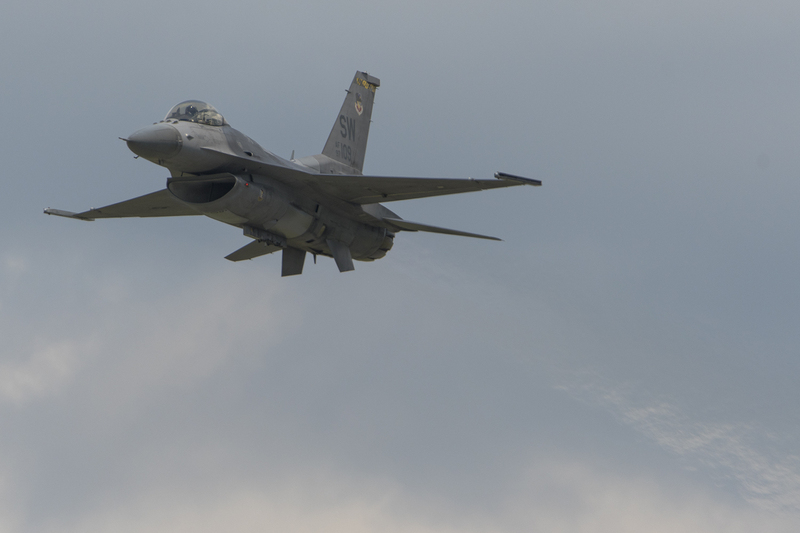 Following the break, the aircraft performed passes down the runway, with the Viper’s pass leading into a pitch up break to land. “Rain” turned final with three greens, and after touching down rolled out on Stewart’s Runway 27, taxied back to the waiting crew chiefs. 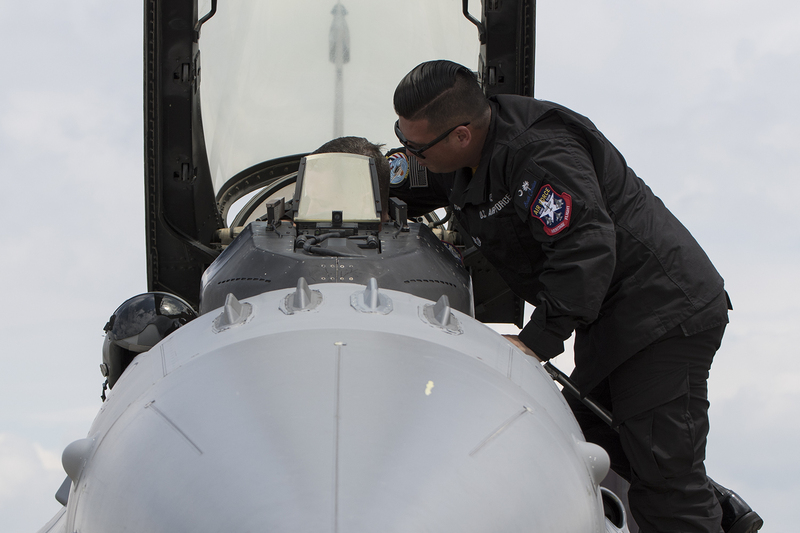 With the same military precision as the launch, the crew chiefs recovered the F-16 and performed the post flight checks. 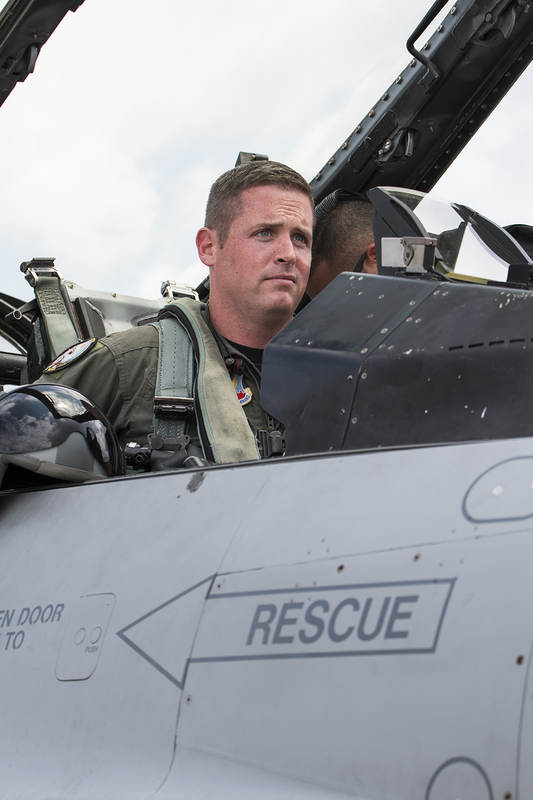 As the engine spooled down, SSgt. Harris assisted Maj. 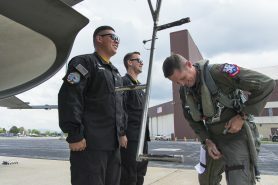 Waters out of the cockpit before securing the aircraft and replacing the covers and plugs with SSgt Dizes. 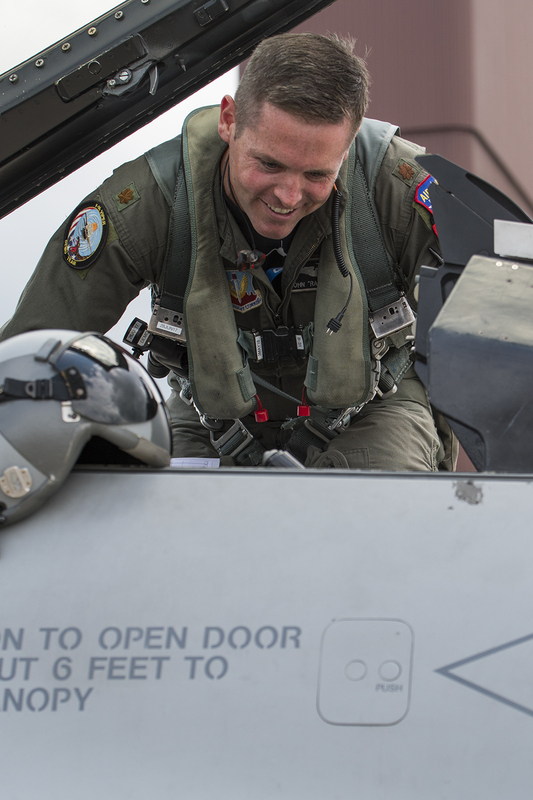 During the postflight debrief the camaraderie between pilot and crew remained evident as the jet’s condition and performance were relayed from an appreciative and talented pilot to the hard working crew chiefs who make it all possible. It is a rare opportunity to be so close to an active tactical aircraft, even more during pre- and post-flight operations. 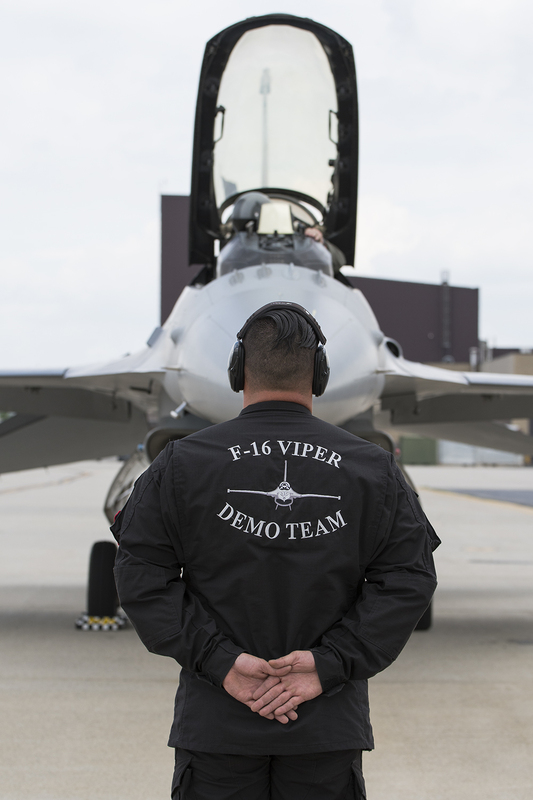 It was a privilege to be in the middle of such a professional and dedicated team to experience a small part of the Viper Demo Team mission. 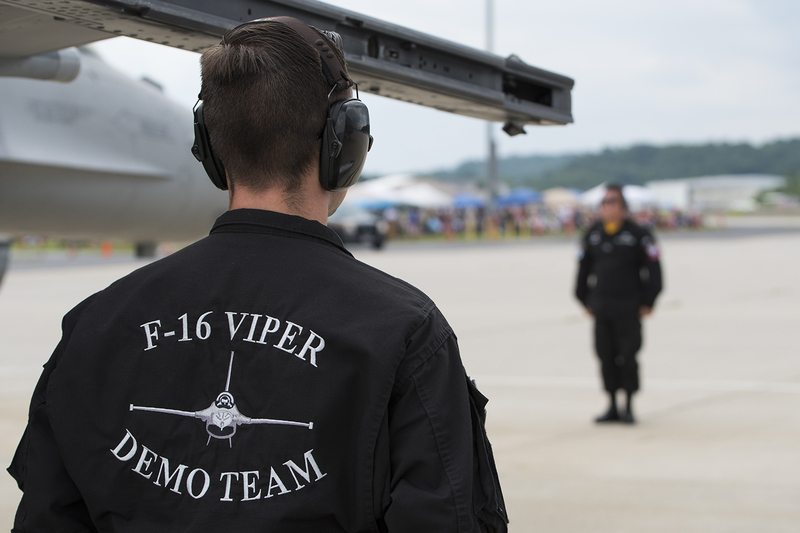 If you get a chance to see the Viper Demo Team in person, be sure to stop by the black and yellow tent they set up at show sites to say hi or pick up some team merchandise, and don’t forget to wave during the knife edge passes. Trust me when I say “Rain” can see the crowd clearly through the Viper’s signature bubble canopy! 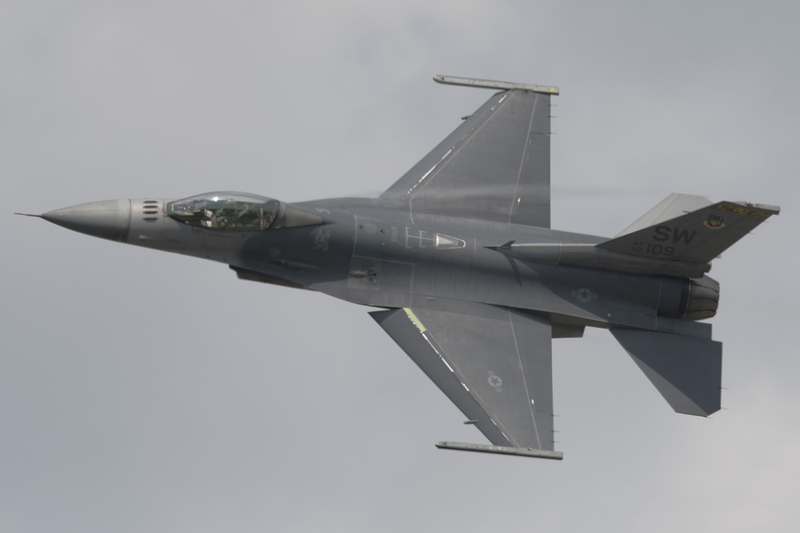 The author would like to thank the entire Viper Demo Team for their hospitality and assistance in making this article possible!